I have had this review in the hopper for the longest time (uploaded the image to Flickr on 9/14/2010), but I am just now finally getting around to typing it up. Why? Who knows. 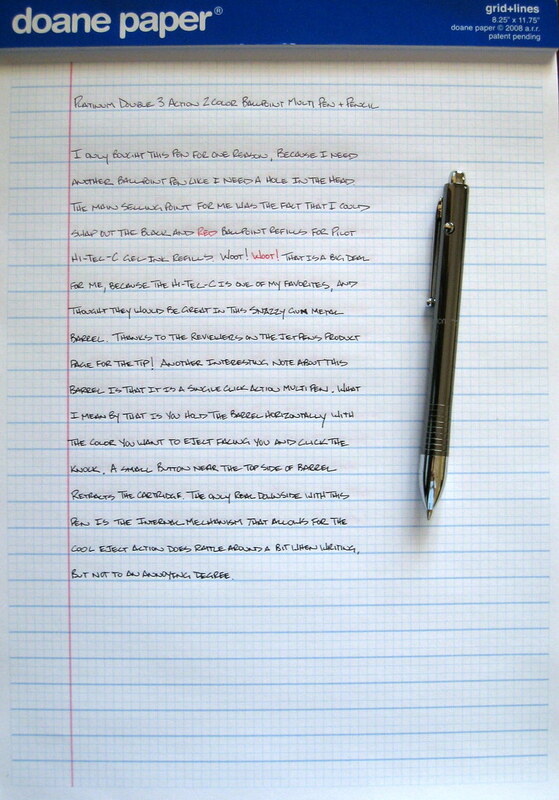 The Platinum Double 3 Action 2 Color Ballpoint Multi Pen + Pencil has a lot going for it - besides a long name - but I have found that it is not for me. The thing that attracted me most to this pen was the fact that the Pilot Hi-Tec-C Slims refills fit perfectly into the Platinum body, making this one of the fancier Hi-Tec-C multi pens around. The barrel is exceptionally well designed, with a sleek gunmetal body and sharp chrome accents. The cartridge switching mechanism is interesting in the fact that a single button press exposes the cartridge you want. All you have to do is face the text of the ink color you want towards you, press the button, and bingo! Out pops your ink or lead. I have never been able to get used to it though. I felt the overall package was a little lighter feeling than I expected, plus the switching mechanism caused some rattling when writing. Not terrible, but enough to notice. In the end, I haven't gotten much use out of it. Maybe it is time to take the Slims refills back out and use them for something else. Posted on February 3, 2011 by Brad Dowdy and filed under Multi Pen, Pen Reviews, Platinum.